Ask Germans who lived under the German Democratic Republic what they feared most in those days, and they'll likely say the agents of the Ministry for State Security, best known as the Stasi. Ask those same Germans what they laughed at most in those days, and they may well give the same answer. As one of the most thoroughly repressive secret police forces in human history, the Stasi kept a close eye and a tight grip on East German society: as one oft-told joke goes, "Why do Stasi officers make such good taxi drivers? You get in the car and they already know your name and where you live." But this fearsome vigilance went hand-in-hand with technological limitation as well as plain ineptitude: "How can you tell that the Stasi has bugged your apartment?" another joke asks. "There's a new cabinet in it and a trailer with a generator in the street." When the Stasi turned this kind of crude but intense scrutiny to certain aspects of life, the results almost satirized themselves. 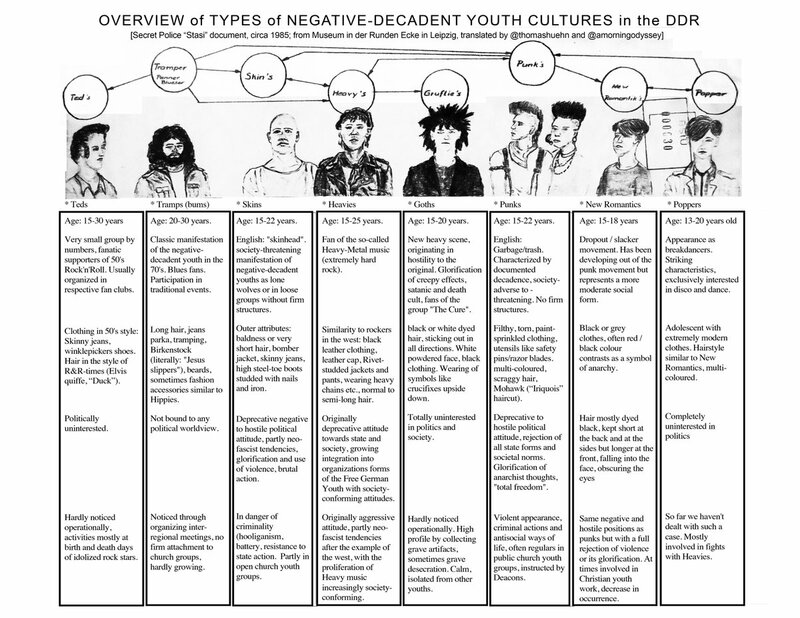 Take, for instance, this circa-1985 internal guide used to identify the "types of negative decadent youth cultures in the German Democratic Republic," posted on Twitter by musician and writer S. Alexander Reed and later translated into English by a few of his followers. 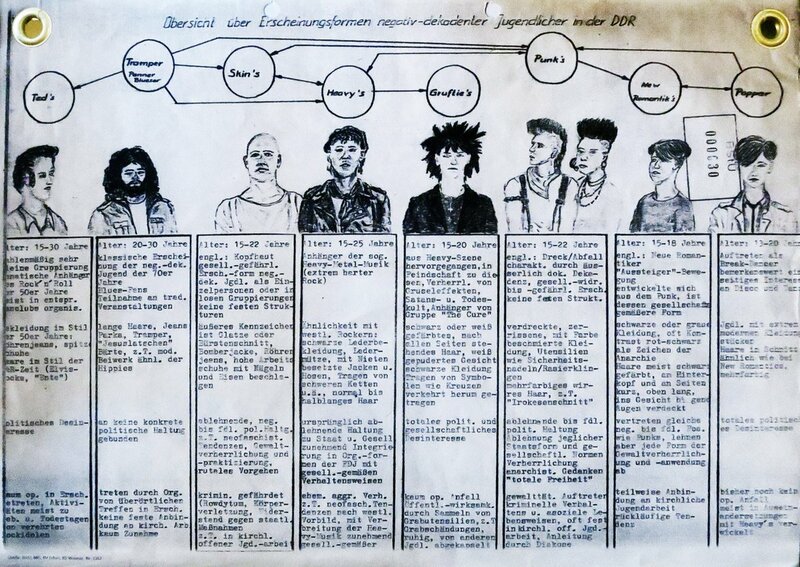 The chart breaks down the supposedly decadent youth cultures of mid-1980s East Germany into eight groups, describing their interests, appearance, political inclinations, and activities in the columns below. The rock-and-roll-oriented "Teds," dressed in a "50s style," don't seem to rouse themselves for anything besides "birth and death days of idolized rock stars." The "Tramps," a "classic manifestation of the negative-decadent youth in the 70s," adhere to the trends of a somewhat more recent era. The fans of "extremely hard rock" known as "Heavies" once held a "deprecative attitude towards state and society," but seemed at the time to become "increasingly society-conforming." Other youth cultures considered decadent by the Stasi bore labels that might still sound familiar across the world. The "Goths," a "satanic and death cult," are noted for their "glorification of creepy effects" and for being "fans of the group The Cure." Though they may have been "hardly noticed operationally," the "punks" presented a more clear and present threat, what with their "deprecative to hostile political attitude, rejection of all state forms and societal norms," "anarchist thoughts," and belief in "total freedom." You can see the chart in a larger size here, and if you'd like to examine the real thing, you have only to visit Leipzig's Museum in der Runden Ecke (or view it online here). The document resides in its collection of the tools of the Stasi trade, including, in the words of Atlas Obscura, "old surveillance cameras, collections of confiscated personal letters, and crisp uniforms letting visitors get a glimpse into the world of brutal state espionage." Germans who remember all the power the Stasi could potentially wield over their lives — a power, for all they knew, about to descend on them any moment — must still feel a chill upon seeing one of those crisp uniforms. Now we know that their wearers might, upon laying eyes on Birkenstocks ("literally: 'Jesus slippers'"), red and black worn together ("contrasts as a symbol of anarchy"), or a mohawk (or "Iriquois") haircut, have felt apprehensive themselves.